Designated a National Historic Landmark in 1976, the Green-Meldrim House is considered one of the most beautiful examples of Gothic Revival-style architecture in the American South. Located on the west side of Madison Square, the residence served as the headquarters for General William T. Sherman when he occupied Savannah after his famous Civil War March to the Sea. The stucco-covered brick exterior boasts architectural details like bay windows and a top-notched parapet ringing the roof as well as a cast iron porch and front fence. The iron portico that adorns the entrance is the only known architectural feature of this type in the United States. The interior features ornate plaster, black walnut woodwork and ironwork along with a curved freestanding staircase topped by a skylight. Other ornamentation includes marble mantles, matching chandeliers and gold leaf-framed mirrors imported from Austria. Charles Green arrived in Savannah in 1833 with little more than his dreams. He eventually made a fortune as a ship owner and cotton trader. By 1850, the entrepreneur had accumulated enough wealth to commission New York architect John Norris to design the luxurious villa, which reportedly cost more than $90,000. This amount would be equal to more than $2.2 million today. Hoping to protect his home from destruction by Union forces, Green greeted Sherman and offered the use of his residence as the general’s headquarters in December 1864. Although Sherman initially did not want to use a private residence for fear of damaging it, the Union commander accepted the offer after touring the house and grounds. Inside this residence, Sherman penned his famous telegram to President Lincoln in which he presented the City of Savannah as a Christmas present to the Chief Executive. The villa served as Sherman’s headquarters until February 1, 1865. At the close of hostilities, Green again resided in the home until his death in 1881. His son Edward Green inherited the property and lived in the residence for 10 years before selling it to Judge Peter Meldrim. A former Army officer and president of the American Bar Association, the judge also served one term as mayor of the city. In 1943, St. John’s Episcopal Church purchased the building from the Meldrim family for various church-related functions. The Green-Meldrim House is the parish house for St. John’s Episcopal Church. The house is open for public guided tours on Tuesdays, Thursdays and Fridays from 10 a.m. until 4 p.m. Saturday hours are from 10 a.m. until 1 p.m. The last tour starts a half hour before closing. While tours are conducted in English, brochures are available in French, German and Spanish. Students receive discount admission, and pre-school children are admitted free. The museum house is closed from mid-December until just after New Year’s Day as well as all of Holy Week. 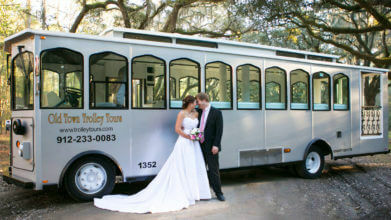 For those aboard the Old Town Trolley, hop off at Stop #3. Named for the fourth president of the United States, Madison Square features a statue honoring Sergeant Jasper, a hero of the Siege of Savannah. Although mortally wounded, he saved his company’s colors. The park also contains historic cannons. A National Historic Landmark, the Sorrel-Weed House is considered one of the most beautiful mansions in Savannah. Completed in 1841, the Greek Revival-style home was designed by Irish architect Charles Cluskey. The residence features a sweeping double entrance, a portico with Doric columns and a parapet with elliptical arches. St. John’s Episcopal Church is known for the melodious sounds of its bells and magnificent stained glass windows that depict scenes from the New Testament. Completed in 1853, it was designed by Calvin Otis in a Neo-Gothic style. A ship’s mast is situated in the center of the church spire. General Sherman attended services here during his time in Savannah.